Certified Organic Personal Care Products! 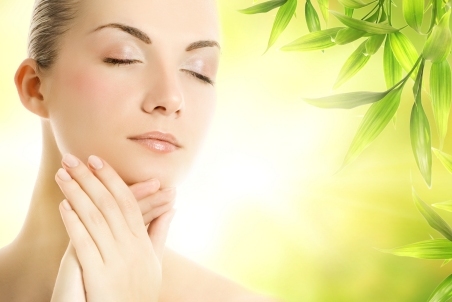 Pamper and nurture your skin with vital nutrients. Awaken your complexion with the finest truly 100% natural ingredients. Indulge your senses with exquisite scents and luxurious textures. 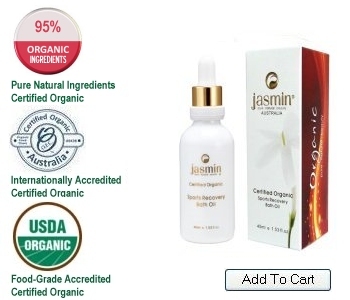 You and your family deserve nothing less than the pure, natural beauty of Jasmin & Koala Baby --- 100% genuinely natural and USDA/OFC internationally certified organic skin care products. 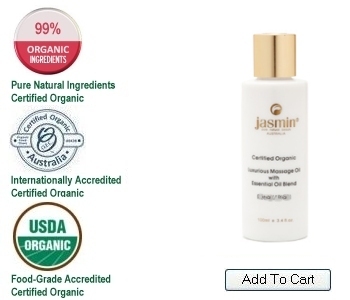 Compare to all other premium brand labels - only Jasmin Organics can verifiably state that every product is formulated using only the most natural and beneficial ingredients - with a true certified organic product pedigree. Totally chemical and toxin free, in a luxurious premium blend! 100% Natural -- 98% Certified Organic Ingredients -- Unmatched in the industry! A concentrated botanical blend emamating with the certified organic essential oils Frankincense and Patchouli with both plant and marine extracts to assist in the reduction of the appearance of fine lines. The Rosehip and Avocado Oil blend also help assist firm the facial muscles while giving an deep tissue hydration and moisturization to the skin leaving producing a fresher, more radiant and youthful-looking complexion. Leave on for 5-10 minutes or until completely dry and then simply wash off with a face cloth. Suitable for all skin types. Ingredients: Aloe Vera (Aloe barbadensis) Leaf Gel*, Glycerin* (Olive and Coconut Derived), Oleo europaea (Olive Leaf) Extract*, Levulinic Acid (Corn Derived) Preservative, Rosmarinus officinalis (Rosemary) Flower Extract*, Pisum sativum (Green Pea) Fruit Extract, Echinacea (Echinacea angustifolia) Root Extract*, Calendula officinalis (Marigold) Flower Extract*, Camelia sinensis (Green Tea) Extract*, Echinacea (Echinacea angustifolia) Root Extract*, Pyrus malus (Apple) Fruit Extract*, Scierotium rolfsil (Natural Gum), Cyamopsis tetragonoloba (Guar) Gum*, p-Anisic Acid (Basil Derived) Preservative, Terminalia ferdinandiana (Kadadu) Plum Extract, Vitis vinifera (Red Grape Reseretrol) Fruit Skin Extract, Cucumis sativus (Cucumber) Extract*, Medicago sativa (Alfalfa) Leaf Powder*, Durvillea potatorum (Kelp) Seaweed Extract*, Pelargonium graveolens (Geranium) Flower Oil*, Boswellia neglecta (Frankincense) Gum Oil*, Hippophae rhamnoides (Seabuckthorn) Fruit Oil*. May contain essential oil elements of Geraniol, Linalool and d-Limonene. 100% Natural -- 100% Certified Organic Ingredients -- Unmatched in the industry! 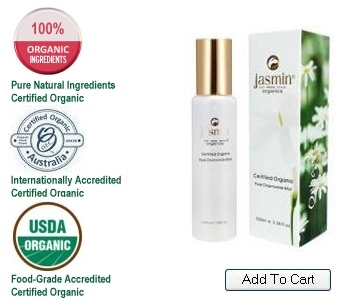 Jasmin's Chamomile Mist has been expressly formulated from pure certified organic Chamomile water (distilled from the flowering tops of the Chamomile plant). It is perfect for use as a facial spritzer when travelling or staying in air-conditioned environments, and is well suitable for dry, sensitive and inflamed skin types. The spray can also be used throughout the day to soothe and rehydrate the skin while it's soft fragrance can help relax and calm the emotions. It is also known to help relieve discomfort from insect bites and itching, and often used to reduce puffiness and dark circles around the eyes. Suitable and recommended for all skin types. Ingredients: Chamomile Flower Water*, Grain-Derived Alcohol*. Jasmin's Neroli Mist has been lavishly formulated from pure certified organic Neroli water, which has been steam distilled from thousands of delicate orange blossom petals. Neroli (commonly known as Bitter Orange Blossom) is perfect for use as a facial spritzer as it is renowned for its uplifting, refreshing and restoring abilities. It is particularly well suited for combination and mature skin types. The spray can be used throughout the day to calm and balance the skin, all the while its beautiful fragrance helps to relieve anxiety and stress. Suitable and recommended for all skin types. Ingredients: Orange Blossom Water*, Grain-Derived Alcohol*. 100% Natural -- 95% Certified Organic Ingredients -- Unmatched in the industry! A new breakthrough in the beauty industry. 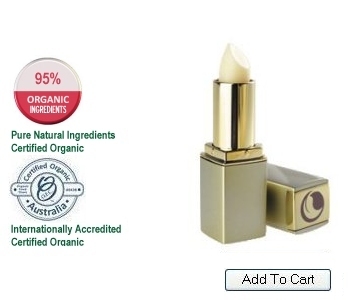 Our exclusive certified organic lip balm formulation ensures that you no longer need to be fearful of ingesting harmful chemicals such as lead, aluminium, artificial colourings, petroleum jelly, preservatives and chemical sun screens which are commonly used in today's average lipstick and lip balm products. 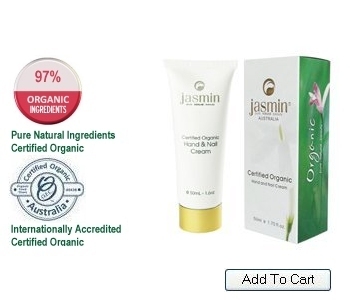 Jasmin's certified organic Natural Lip Balm is guaranteed to be free of chemicals and harmful ingredients and are even safe to eat. Rich in nutrients and vitamins it will moisturize your lips and enhance natural lip pigmentation. Apply as often as required like normal lipsticks but with the peace of mind that they are certified organic and free of all chemicals. Ingredients: Castor Oil*, Rosehip Oil*, Beeswax*, Jojoba Oil*, Safflower Oil*, Shea Butter*, Carnauba Wax*, Olive Virgin Oil*, Natural Vitamin E, Bitter Almond Kernel Extract, Vanilla Bean Extract, Rose Otto Oil*, and may contain naturally-occuring earth-derived Zinc Oxide and/or Iron Oxides. 100% Natural -- 99% Certified Organic Ingredients -- Unmatched in the industry! 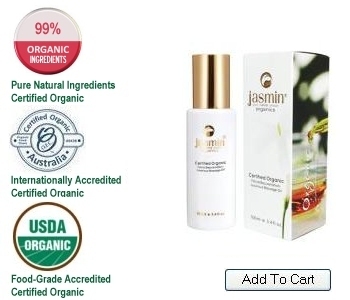 The Jasmin Facial Rejuvenation Massage Oil is a rich blend of pure 100% certified organic essence and essential oils which have been carefully cold pressed and steam distilled from a specially selected range of plants and flowers. They are then carefully blended at our facility near the top of Mount Tamborine in the beautiful Gold Coast hinterland of Australia. This Facial Rejuvenation Massage Oil has been specifically formulated to relieve muscle tension around the face resulting in a silky smooth skin and a glowing complexion, while promoting sensory therapy and healing. Ingredients: Apricot (Prunus armeniaca) Kernel Oil*, Sunflower (Helianthis annus) Seed Oil*, Jojoba (Simmondsia chinensis) Bean Oil*, Rosehip (Rosa canina) Fruit Oil*, Patchouli (Pogostemon cablin) Leaf Oil*, French Lavender (Lavandula angustifolia) Flower Oil*, Geranium (Pelargonium graveolens) Flower Oil*, Palmarosa ( Cymbopogon martinii) Leaf Oil*. The Luxurious Body Care Base Massage Oil is a superb blend of pure 100% certified organic carrier oils which have been carefully selected and then cold pressed to ensure all of the natural nutrients are retained. They are then expertly blended at our 'state of the art' facilities at the top of Mount Tamborine in the beautiful Gold Coast hinterland of Australia. The apricot kernel oil provides for a gentle and light penetration of the delicate facial layers. This ensures a restoring and moisturizing effect while also preventing dryness, itchiness and inflammation. The rosehip oil is high in Vitamin C which is important for regenerative skin care. Use as a general facial massage oil or customize with your own blends from our extensive range of 100% pure certified organic essential oils to create a personalized facial massage. Ingredients: Apricot (Prunus armeniaca) Kernel Oil*, Sunflower (Helianthis annus) Seed Oil*, Jojoba (Simmondsia chinensis) Bean Oil*, Rosehip (Rosa canina) Fruit Oil*. Jasmin's Hydrating Sun Care Oil is a rich luxurious blend of nourishing oils, which helps to protect your skin against today's harsh climate. Produced fresh from an exotic range of flowers, herbs, plants and organic essential oils. This is a Sun Care product, not a sun block. It helps your skin react naturally to sun exposure by slowly tanning in a natural way. 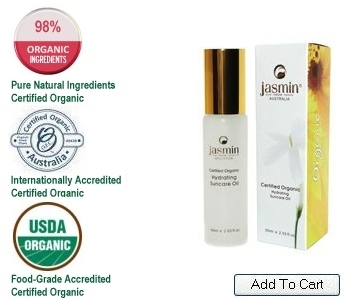 Jasmin Sun Care Oil prevents the drying effects of the sun, nourishing and hydrating your skin. It provides you with a healthy glowing look and is rich in antioxidants, vitamins and nutrients, all derived from nature's own plant oils. Ingredients: Aloe Vera Gel*, Rose Hydrosol*, Sweet Almond Oil*, Vegetable Glycerine*, Macadamia Oil*, Sesame Seed Oil*, Rosehip Oil*, Avocado Oil*, Shea Butter*, Palm-Derived Emulsifying Waxes, Jojoba Oil*, Natural Vitamin E, Rose Maroc Absolute Oil*, Chamomile Extract*, Marigold Extract*, Rosewood Oil, Ylang Ylang 1st Oil*, Rose Geranium Oil*, Vanilla Bean Oil*, Frangipani Absolute Oil, Seabuckthorn Oil*. 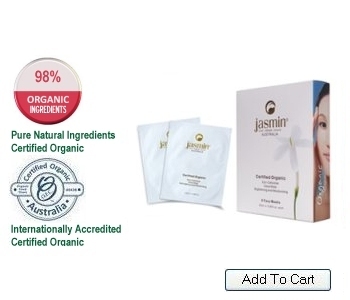 100% Natural -- 97% Certified Organic Ingredients -- Unmatched in the industry! This heavenly Hand & Nail Cream moisturises and softens your hands and feet while helping to strengthen and revilatize the nails. A rich, non-greasy, nourishing formula, which is excellent for use in hand or foot massage or as a refreshing 'pick-me-up'. It helps to relax the hands and feet. Leaves your skin and cuticles silky soft, supple and moisturised. Ingredients: Aloe Vera Gel*, Rose Hydrosol*, Sweet Almond Oil*, Vegetable Glycerine*, Sesame Seed Oil*, Shea Butter*, Rosehip Oil*, Macadamia Oil*, Avocado Oil*, Palm Derived Emulsification Waxes, Organic Jojoba Oil*, Natural Vitamin E, Coconut Oil Derived Emulsifier, Rose Maroc Oil, Chamomile Extract*, Marigold Extract*, Grapefruit Seed Extract*, Lavender Oil*, Lemon Oil*, Seabuckthorn Oil*, Rose Geranium Oil*, Sandalwood Oil. The regenerative Sports Recovery Bath Oil has been specifically formulated with a blending of powerful certified organic oils to help assist in relieving tired and aching muscles often associated with exertion, sporting injuries and muscle sprains. This is an uplifting, stimulating and performance bath oil that will help to leave you feeling fully rejuvenated. Ingredients: Sunflower Seed Oil*, Coconut Oil*, Apricot Kernel Oil*, Lavender Oil*, Ma Yulan Oil*, Rosemary Oil*, European Spearmint Oil*, Black Pepper Oil*, Youjiali Oil*, Lemon-Grass Oil*. The Relaxation Massage Oil exotic blending has been specifically formulated with pure 100% certified organic plants and flowers to help relieve the stress and anxiety of everyday life. The essential oils also provide a grounding and soothing effect while leaving the whole body feeling nourished and refreshed after a deep soothing massage. This blend works perfectly to harmoniously balance the mind, body and soul. Ingredients: Sweet Almond (Prunus amygdalus) Oil*, Sunflower (Helianthis annus) Oil*, Jojoba (Simmondsia chinensis) Oil*, Evening Primrose (Oenothera biennis) Oil*, Rosehip (Rosa canina) Oil*, French Lavender (Lavandula angustifolia) Flower Oil*, Bergamot (Citrus aurantim var. bergamia) Oil* [non phototoxic], Cedarwood (Cedrus atlantica) Oil*, Peppermint (Mentha piperita) Oil*. 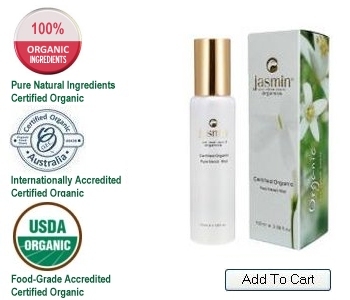 The Jasmin Uplifting Massage Oil is a luxurious blend of pure 100% certified organic blended essentrial oils which have been carefully cold-pressed and steam distilled from a specially selected range of plants and flowers. A uplifting, refreshing and stimulating blend that may assist with physical and mental fatigue - as well as to possibly promote mental clatity and concentration. . The Spiritual Harmony blend has been specifically formulated to provide serenity and emotional balancing of the senses. The essential oils also provide a feeling of inner peace and happiness after a deep soothing massage. This blend works perfectly to help reduce the effects of stress and anxiety. Ingredients: Sweet Almond (Prunus amygdalus) Oil*, Sunflower (Helianthis annus) Oil*, Jojoba (Simmondsia chinensis) Oil*, Evening Primrose (Oenothera biennis) Oil*, Rosehip (Rosa canina) Oil*, Sweet Orange (Citrus sinensis) Oil*, Ylang Ylang (Cananga odorata) Oil*, Frankincense (Boswellia carteri) Oil*, Vetiver (Vetiveria zizanoides) Oil*. The Purifying Massage Oil blend has been specifically formulated with essential oils traditionally used to help cleanse and purify--- not only the body --- but also the mind and spirit. Ingredients: Sweet Almond (Prunus amygdalus) Oil*, Sunflower (Helianthis annus) Oil*, Jojoba (Simmondsia chinensis) Oil*, Evening Primrose (Oenothera biennis) Oil*, Rosehip (Rosa canina) Oil*, Cypress French (Cupressus sempervirens) Oil*, Lime (Citrus aurantifolia) Oil*, Rosemary (Rosmarinus officinalis) Oil*. The Body Care Skin Regeneration blend has been precisely formulated with herbal botanical oils which may enhance skin elasticity, promote regeneration of skin cells, and soothe dry and irritaed skin. Ingredients: Sweet Almond (Prunus amygdalus) Oil*, Sunflower (Helianthis annus) Oil*, Jojoba (Simmondsia chinensis) Oil*, Evening Primrose (Oenothera biennis) Oil*, Rosehip (Rosa canina) Oil*, Mandarin Red (Citrus reticulata) Oil*, Palmarosa (Cymbopogon martinii) Oil*, Lavender French (Lavandula angustifolia) Oil*, Sandalwood (Santalum spicatum) Oil*. The regenerative Sports Recovery Massage Oil has been specifically formulated to help relieve tired and aching muscles often associated with tired muscles, sporting injuries and muscle sprains. Massage therapy may also help relieve the symptoms of joint pain. This is an uplifting, stimulating and performance oil that will leave you feeling fully rejuvenated. Ingredients: Sweet Almond (Prunus amygdalus) Oil*, Sunflower (Helianthis annus) Oil*, Jojoba (Simmondsia chinensis) Oil*, Evening Primrose (Oenothera biennis) Oil*, Rosehip (Rosa canina) Oil*, Rosemary (Rosmarinus officinalis) Oil*, Black Pepper (Piper nigrum) Oil*, Eucalyptus (Eucalyptus globulus) Oil*, Lemongrass (Cymbopogon citratus) Oil*. The Luxurious Body Care Base Massage Oil is a beautiful blend of pure 100% certified organic carrier oils which have been carefully selected and then cold pressed to ensure all of the natural nutrients are retained. They are then expertly blended at our 'state of the art' facilities at the top of Mount Tamborine in the beautiful Gold Coast hinterland of Australia. The evening primrose and sweet almond oils are extremely moisturizing and revitalizing; blended with the powerful rosehip oil which provides excellent regenerative skin care. Use as a general body massage oil or customize with your own blends from our extensive range of 100% pure certified organic essential oils to create a personalized body massage. Ingredients: Sweet Almond (Prunus amygdalus) Kernel Oil*, Sunflower (Helianthis annus) Seed Oil*, Jojoba (Simmondsia chinensis) Bean Oil*, Evening Primrose (Oenothera blennis) Seed Oil*, Rosehip (Rosa canina) Fruit Oil*, Natural Vitamin E (d-a-Tocopherol). An essential provision for the traveling individual.